Summerhill's SG103 is seen operating Route 120 at the Parnell Street terminus on the 19th October 2018 (click on photo for larger version). History has a way of repeating itself. 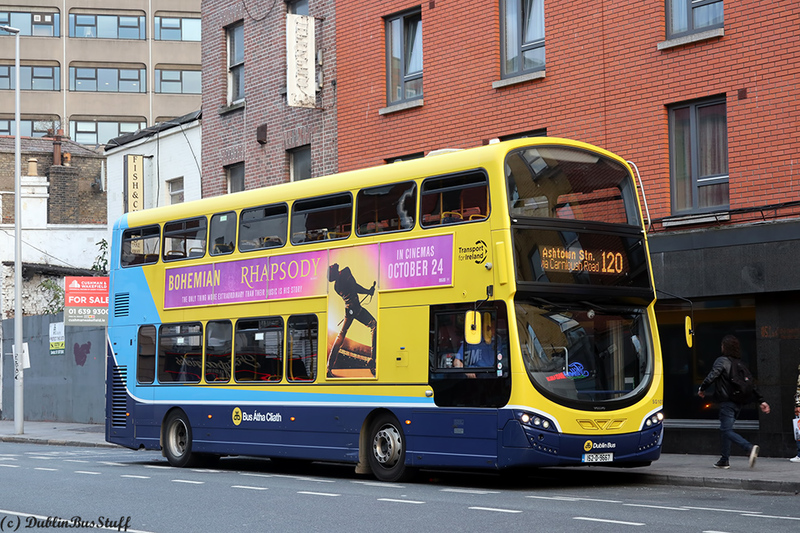 With Route 14 becoming fully Donnybrook operated from the 7th October 2018, Summerhill have taken over Route 120 (Parnell Street to Ashtown Station) from Phibsboro from the same date. Summerhill may not be the first garage that comes to mind when you think of Cabra services, however the 120 when introduced was a sort of hybrid of the former Route 22A to Boombridge, and the former Route 12 to Fassaugh Road. The 12 had been fully withdrawn in the 80s, years before the introduction of Route 120, but the 120 brought buses back to this east part of Cabra. Route 12 was a Summerhill route up to the opening of Phibsboro depot in June 1971, hence my comment about things repeating themselves. History had very little to do with the change, just a need to move duties to Summerhill with the loss of Route 14. 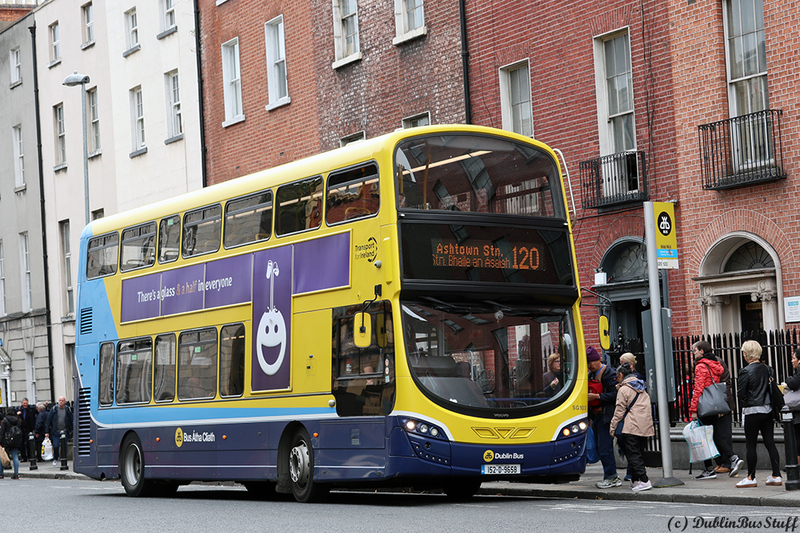 The 120 timetable has been cut back significantly due to the new Luas line, with the reduction of buses in the daytime rather than extra running time which has stayed pretty constant. Summerhill, being Summerhill, allocate pretty much anything to the 120, AVs, AXs, Airlink VGs, GTs and SGs, though each time I've tried getting photographs I've just got SGs. Summerhill's SG107 is seen operating Route 120 at the Parnell Street terminus on the 20th October 2018 (click on photo for larger version). 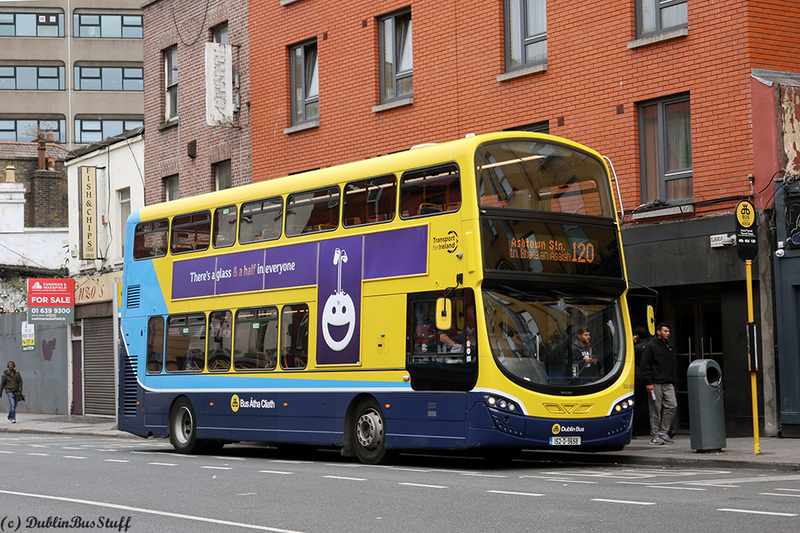 Summerhill's SG103 is seen on Parnell Square West operating Route 120 on the 19th October 2018 (click on photo for larger version). N.B. This website is not affiliated with Dublin Bus. The information contained herein is intended for enthusiast reference. For all current timetable and route information please refer to the official Dublin Bus Website.